If you have a VPS or dedicated server and are looking for a free web hosting control panel, then ZPanel probably the best choice for you. Not only it is a free, complete, and open-source web hosting system, its web interface is also responsive making it easy to manage our hosting from any mobile devices, thanks to Twitter Bootstrap CSS Framework for making the responsive CSS framework. Installing zPanel on Centos is easy. 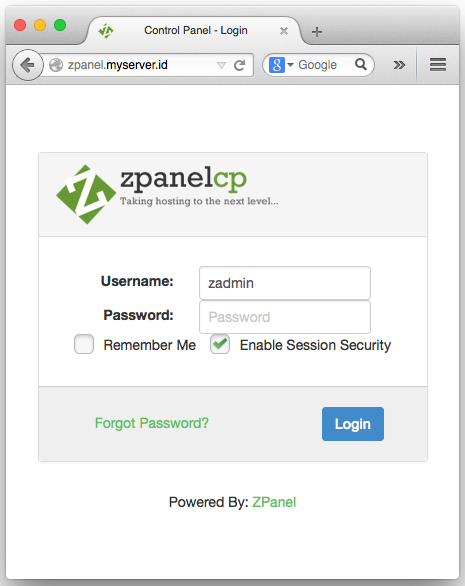 This post guides you how to install zPanel 10.1.1 on CentOS 6.6. As root, make the script executable and then run it! Therefore TZ='Asia/Jakarta' will be used. Local time is now:	Mon Dec  8 18:19:17 WIB 2014. Universal Time is now:	Mon Dec  8 11:19:17 UTC 2014. Since I live in Jakarta, Indonesia, the timezone is set to Asia/Jakarta. Change it to your timezone. Enter the FQDN you will use to access ZPanel on your server. You need to set the FQDN and IP address for the ZPanel. Later to access the zPanel you can use either via zpanel’s fqdn name or the IP address. The script will download the dependency packages and the zPanel software itself. It may take long time depending on your internet connection and server specification. If everything installed successfully, the script will tell you the zPanel admin account and password to manage your hosting. You need to restart the server to complete the installation. Once it is restarted, use your favorite browser to access the zPanel. Use the ‘ZPanelX Username’ and ‘ZPanelX Password’ to login. If granted, you will be redirected to ZPanel Admin page and are ready to manage your hostings.